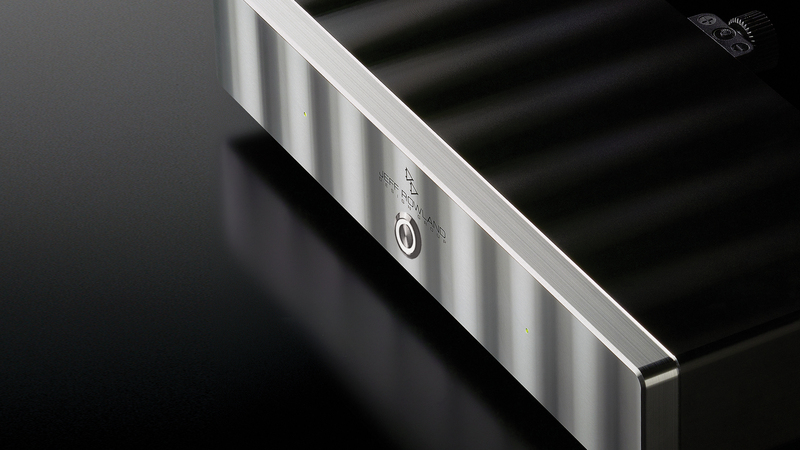 The Model 125 stereo bridgeable power amplifier delivers dynamic realism and refinement from its solid aircraft-grade aluminum chassis, a perfect match for the sleek profile of its companion Capri S2 preamplifier. From a single M125 in stereo mode powering an intimate analog system, up to several bridged units driving a multi-speaker setup, down to a bridged pair controlling demanding 4-Ohm monitors, the energy-efficient Model 125 power amplifier delivers consistent resolution and authority with Rowland finesse. Precision-machined from a solid block of aircraft grade 6061-T6 aluminum, provides exceptional thermal heat transfer/dissipation, RFI/EMI shielding, and resonance control. Inherent cancellation effects of balanced topology implemented throughout all power and input/output circuits ensures greatly reduced distortion and noise under dynamic signal conditions. Extensive use of Lead (Pb)-free, low temperature coefficient, active and passive surface-mount components results in significantly smaller loop areas, reduced circuit capacitance and inductance, and introduces less noise than conventional leaded components. All signal carrying input and output wires are teflon coated, also for low dielectric energy storage, further ensuring that each audio note reproduced naturally decays into the deeper silence of the music. Transformer coupled input circuitry provides universal component compatibility and virtually eliminate ground loop noise and RFI/EMI. Transformer coupling ensures identical amplifier overall gain when using unbalanced input adapters. Highly efficient, compact, light weight, switch-mode power supply provides optimum voltage regulation for all circuits and operating conditions, and allows for quiet operation over a wide range of AC mains power sources. CE approved speaker output terminals require no tools for secure, low resistance connections, and allow for easy bi-wiring applications. 15 Amp AC power inlet accepts a wide variety of after-market high-performance power cables. Illuminated front panel push-button switches the amplifier into standby mode (< 1 watt consumption). 12V 3.5mm jack on rear panel permits amplifier power on/standby switching in remote and home theater applications.